PureDWTS Season 24 Debate – Battle of the Ringers: What Makes Heather Morris So Ringer-y? Let me start off by recapping Heather’s background for those who don’t really know it: Heather’s been dancing since she was 9 years old, and has trained in jazz, tap, and contemporary, primarily. She tried out for season 2 of So You Think You Can Dance, and made it through Vegas week to the “Green Mile” (the stage of the competition where the judges select who will and won’t advance to live shows) but was not chosen as one of the final top 20. She landed a gig dancing backup for Beyonce in 2007, and also nabbed a number of small dance roles in various TV shows and movies. She was eventually brought to the Glee set in 2009 to help teach the “Single Ladies” dance to some of the cast, and was so well-liked by the cast & crew that Ryan Murphy actually created the role of Brittany for her. So to be clear: Heather started off as a PROFESSIONAL DANCER – she only dabbled (only semi-successfully, I might add) in acting & singing as a result of her role on Glee. She is a dancer that (kinda) acts and sings – not the other way around. Yes, this is an important distinction to make – and generally the biggest factor that sets her apart from previous ringers. Read more..
Red Carpet Roxy talked Tom Bergeron, Sharna Burgess, Karina Smirnoff, Danica McKellar and Kym Johnson about this season of Dancing With The Stars at the Wrap Party!! This is fun…especially the end. Check it out! And below is Lois with another one of her fabulous poems…. The spectacular conclusion will be a dazzling sight to see! A SHOCKING ELIMINATION, SHARNA AND CHARLIE SADLY HAD TO GO! WE WILL MISS THEM SO MUCH AND HIS BRIGHT LIGHT ON THE SHOW! PAINTING A PORTRAIT OF DANCE, EASELS OF BALLROOM ON DISPLAY! BRUSHSTROKES OF DANCES, OF DANCERS, IN FULL SPLENDID ARRAY! The title says it all. Here’s to next week! 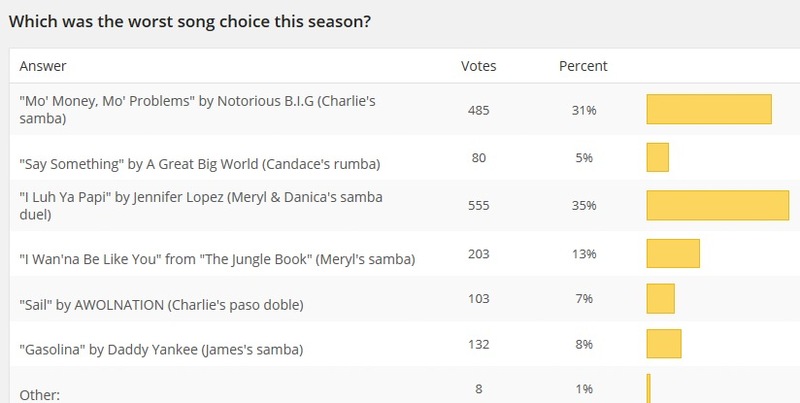 I hope Charlie and Sharna really make a showing for what could have been. I’m loving the part on Derek and Amy too. Amazing! The Afterbuzz TV interviews have been released with JC Rubio. The couples talk of the dances last night and also give a few hints for the finals….uhh, which isn’t much. Note: Derek has no idea (or won’t say) for what they will do for the finals. He doesn’t know the song yet either. Meryl says their freestyle is a secret. Maks says he doesn’t know what they will do yet. Mark is tight lipped. He says they won’t be treating next week any differently and he hopes he and Candace can just enjoy the process. They haven’t posted an interview with Peta and James yet, but, watch this link in case they do soon. ETA: OK! Magazine interviewed Maks and Meryl. They ask Maks if he’s coming back next season. He promises to tell next week and that it’s already been decided. Uggh, I don’t want to even think about it…. As he and Meryl advance to the finals (really, was there ever any doubt? ), the pair aren’t taking anything for granted. Next week’s freestyle should knock everyone’s socks off, although as of last night Maks had no idea what he was going to choreograph. He says by Friday they’ll have something special locked in. ETA2: Below is Extra with the couples…. Also, the On The Red Carpet interviews have been released. And below is Charlie and Sharna with Access Hollywood. Carrie Ann Inaba has also written a new blog at Parade reviewing the night and the dances. Below she talks about the finals. I am a bit upset for what she wrote about Charlie and Sharna…more on that at the link as I am biting my teeth. The finals are going to be great, no doubt about it! It will be exciting and I hope to see some mind-blowing freestyles! I’m also looking forward to seeing each of the couples redo the routines they did when we had the switch up week but with their real partners again. This season has been so different in so many ways, but I do believe it’s been a good season overall and I can’t wait to see who will take home the mirror ball trophy. It’s going to be an intense two nights! Don’t forget we are on Monday night and Tuesday night next week, so keep your schedules clear so you can be right there with us when we crown the season 18 champion! Tweet me and let me know who you think will be taking it home this year! James Maslow wrote about the finals as well at Parade saying this…. We’re both really excited. Peta is ecstatic because it’s only the second time she’s been in the finals. The only other time was in her second season with Donald [Driver] and she won it. So it’s a familiar feeling for her, but she’s also that much more nervous. I’ve literally put blood, sweat, and tears into this competition and making it all 10 weeks is rewarding. We’re going to give it everything we’ve got because at this point there’s just no turning back. Being in these finals is such an honor for me because everyone is so talented. I think Amy has a huge advantage being paired with Derek. He’s very creative with her and making what they do incredibly sharp. Meryl is an incredibly strong dancer and has the technique as an ice skater that’s obviously transitioned well to the dance floor with her and Maks. And Candace has constantly been progressing, and I think America loves seeing that. It’s really hard to say who the biggest competitor is, I guess Meryl, just in terms of dance ability. ETA3: The Ice Network interviewed Charlie and Sharna as well. Below is a take. Thanks to Kate for sending. “It’s been an amazing cap to a wonderful season,” he said. “Going from the Olympics to DWTS, we didn’t have a moment to rest, but it was the best way to do it. Right from the get-go, it was an amazing learning experience. White said he was appreciative that Burgess did not hold back choreographically despite his grueling schedule. Through her, he was able to gain a deep understanding of the origins of many dances he and Davis have interpreted on ice over the years. Burgess said beyond teaching and choreographing, she has enjoyed dancing with White. “The bar is set higher, and there were very high expectations for someone like Charlie,” Burgess said. “I had a lot of pressure on myself to create those amazing routines, to make it difficult enough for him and to give him the great technique on top of it. I didn’t go easy on him, and I didn’t take it easy on myself. I was constantly going back and looking at my work and making sure it was worthy of something that he would do. Team USA also interviewed Charlie and Sharna. This is a good one. Be sure you read it in full at the link. Thanks to Ria for the heads up. At what point did you start to think you were going home? I think as soon as we knew it was the three Olympians in jeopardy, I had a bit of a feeling, but it could have gone any way. Having said that, I’m really looking forward to cheering on my fellow Team USA-ers. How did it feel being eliminated after receiving perfect scores two weeks in a row? It’s disappointing. We were looking forward to moving on and up, and it felt like we were peaking at the right time. It’s just one of those things where it doesn’t work out the way that you want it to, and, thankfully, with all my experience in competing you learn how to handle disappointment. Both of us are looking at the bright side and trying to learn from it. Would you have done anything differently over the past nine weeks? Absolutely not. That’s one of the reasons we can hold our heads so high leaving. We can honestly say to ourselves and to each other that we did pretty much everything we could have, whether it be choreographically or being true to ourselves in a reality TV show, which maybe isn’t always the easiest, or the way we represented ourselves. It’s not easy, but we did literally everything that we could. What is your favorite memory from the show? It’s tough to say there’s just one. I think Disney night when we got to do our (“Supercalifragilisticexpialidocious” dance) was really special. It was one of those moments you’ll never forget. I got to dance with some cartoon penguins — that’s pretty memorable. It was a really special night. Moving on, let’s see what Sharna and Charlie and the other contestants had to say about it with George Pennacchio of ABC7 (a prelude for whats to come with the On The Red carpet Interviews). Be sure to see this link. You can also see Sharna and Charlie interviewed by E News at this link (sorry. I can’t embed it or it messes up the site). Sharna looks so sad and beautiful. Charlie keeps smiling through out. How does he do it? As well as his amazing dancing this season, I don’t think I’ll ever forget his smile. Also, didn’t you love his tails last night? *Oh, and Derek Hough…after that second dance with Amy, all I can say is that when the time comes, can you choreograph my wedding dance? That was just pure brilliance. For more with Derek and Amy, see Pure Derek Hough. ETA: Below is some PopTVDotCom “after dark” coverage…. Read more.. Dancing with the Stars Season 18, Week 8 – Dancing by the Numbers! I kinda have to laugh. Why? Well, besides the large number of people (and websites) who thought that the picture Derek posted of a baby doing a push up was actually him…there were just so many people freaking out over Meryl’s score this week. Sheer panic. Lots of hysteria and a few requests for me to do my numbers post early. Why is this funny? Well, because some of these same people who are now a tad panicked are the same ones who said, when I was complaining about Meryl being propped up, “hey, it’s just a silly dance show.” LOL. So much for the “silly dance show.” I’ll throw it back to you – It’s just a silly dance show. It’s not world peace. And before you get all hoity toity and claim I’m only saying that because Amy is at the top of the leader board, I ask you to please point to where I ever expected her to win, prayed for her to win…hell, point to any post in the last two years or more where I got my knickers in a twist because Derek’s partner might not win. I’m like Derek these days – it’s not about winning any more. And Amy has already won. She won the first time she danced on prosthetics in front of millions of people. That is a massive victory, along with a massive inspiration. Read more.. Things are heating up!! Two more days and counting! !